But instead, he and Curtiss began a commercial airline passenger venture between Long Island and Palm Beach, with Grover Whalen, as the company’s vice-president of operations. The Rodman Wanamaker Flying School was set up in Port Washington. 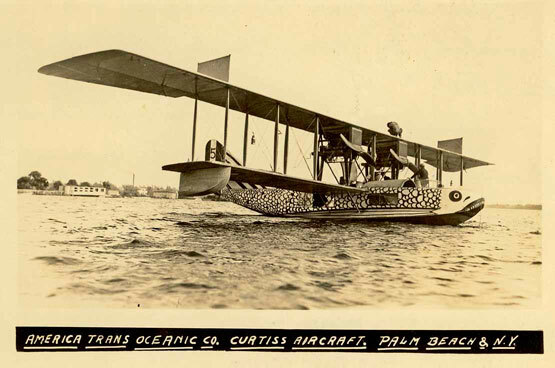 Once in Florida, Trans-Oceanic’s flying boats took off for Nassau, Bimini and Cuba. The company’s Palm Beach hangar housed seven planes. The Big Fish was a converted 12-passenger Curtiss H-16 utilized for trips to Bahamas and Havana. Smaller, six-passenger planes were used for “joy hops” to Miami. The moonlight flight left Palm Beach at 5 pm and arrived in Jacksonville five hours later. The company made four trips a week to Bimini. In 1917, Atlantic City-Palm Beach was an 18-hr. flight; by 1921, New York-Palm Beach took 9 hrs. 56 mins.with one fuel stop.